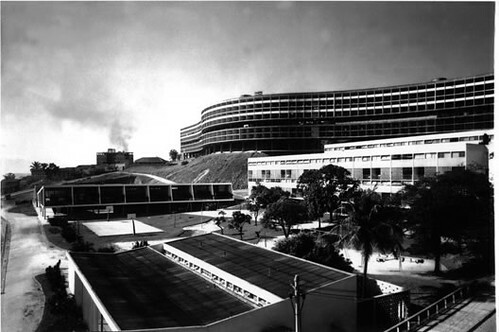 The project was awarded the first prize in the international Bienalle in Sao Paulo in 1953. (built in 1950-52) The project was said to be ‘a simple example of how every city should be built’. Critics of the scheme were less concerned with the architectural design than the rigid regulations imposed by the municipal housing office. Prospective tenants had to undergo rigorous medical tests to avoid introducing disease. The scheme included four housing blocks, a school, playground, health centre, shops and a laundry. All of which were set in a landscape designed by Roberto Brule Marx. The most significant building being the ribbon shaped housing block, seven storeys in height, raised from the ground on pilotis. The building curves to suit the contours of the site. The building has no lifts, all access is by stairs with entrances into the building either at ground level or at 3rd floor where two bridges connect a raised ground plane to the street. This level is partly open space and incorporates a playground, municipal offices, kindergarten and staff rooms for teachers. On the lower levels there are small one bedroom apartments, the upper storeys are mainly two bedroom maisonettes. The space below the building and the 3rd floor open space provide important shaded areas and air circulation. All the rooms have windows and are arranged to provide cross ventilation.